The Production Book is arguably the largest most comprehensive resource of contacts for the Australian film, television, new media and advertising industries. With over 16,000 listings, across 245 categories the directory is an essential tool for every industry professional. 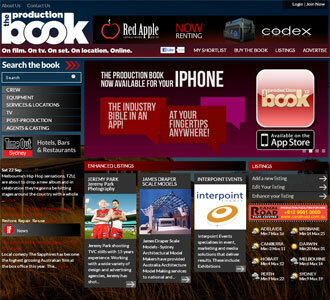 The Production Book continues to be the most widely used and recognised directory for all things film and television. The directory is available in print, online, as an iPhone app and to be released shortly as an iPad app and android app ensuring coverage through all major platforms. There is a dedicated section to the television genre with practically every TV production in Australia using the book including high profile Australian and International television programmes. It is a trusted resource that is known to be current and relevant whose subscribers include key decision-makers from every facet of the industry from production to executive roles, as well as significant international subscribers shooting foreign productions locally. Wherever they are or whatever they need The Production Book is with them in one format or another.